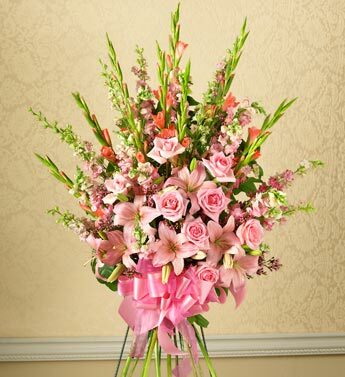 Send your deepest sympathies with this beautiful arrangement that shows your love and caring at a time of loss. Our florists gather the freshest gladiolus, larkspur, snapdragons, roses, and more into a striking bouquet. Arrives tied with ribbons and placed on a wooden easel for a moving tribute. Available in pink or white. Appropriate for friends or family to send to the funeral home •Due to the urgency of the occasion, our florists use only the freshest flowers available, so components may vary. * If you are placing an order within 2 hours of the scheduled event, we recommend that you place your order by phone (323-290-9990) to ensure product availability and timely delivery of your order. Harrison-Ross and its' partners are not responsible for missed viewings and/or funeral/memorial ceremonies. If a service is missed, you will be contacted and informed where your flower order will be held. At that time, you will have 48 hours to retrieve your flowers. Again, for more information, call (323) 290-9990.